Fugu is the Japanese word for Pufferfish or Blowfish, the most delicate, dangerous & expensive fish in the world. Because Fugu is lethally poisonous if prepared incorrectly, it has become one of the most celebrated & notorious dishes in Japanese cuisine. The symptoms from ingesting the lethal dose may include dizziness, nausea or difficulty in breathing. For 50% to 80% of the victims, death follows within 4 to 24 hours. The victim remains fully conscious throughout most of the ordeal, but cannot speak or move due to paralysis & soon cannot breathe & subsequently asphyxiates. If the victim survives the first 24 hours, he or she usually recovers completely. 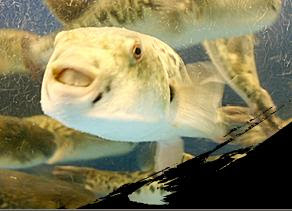 In Japan, discerning gourmets pay tremendous prices for a dinner of Fugu, ranging from about US$100 – US$200 per person. Fugu is extremely expensive & only prepared by trained, licensed chefs who know that one bad cut means almost certain death for a customer. In fact, many such deaths occur annually. Hence, the fish is sliced very carefully to obtain the largest possible amount of meat without the poison. A special knife called Fugu Hiki, is traditionally used to slice Fugu. Each year, these incidents led to between 34 & 64 victims being hospitalized & zero to six deaths. One of the most famous victims was the Kabuki actor & "living national treasure" Bandō Mitsugorō VIII who requested 4 servings of Fugu liver (the most toxic part) & died after eating them. Although Fugu is much celebrated by connoisseurs, the ‘forbidden fruit’ is the only delicacy officially prohibited to the Emperor of Japan. Because of all these notorious facts, plus I ain’t a fish lover, it took quite a while for me to take up the challenge & to accept my Japanese friend’s invitation to this popular Fugu restaurant, Tora Fugu Tei, at Ginza. I’m glad I’d the privilege of surviving the ordeal & live to tell the tale & not writhing on a hospital bed with convulsions. My 1st fatal bite – Fugu Yubiki. Spikes in the skin are pulled out of the Fugu & eaten as part of a salad called Yubiki. I cautiously lifted the Fugu skin with my chopsticks & put it on the tip of my tongue. 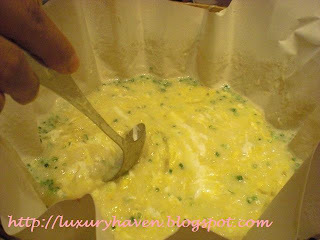 The appetizer is tasteless but the chewy skin went well with the ponzu sauce (mixture of citrus juice & soy sauce) given. Soy-based ponzu is one of the key ingredients in the Fugu experience. I waited in suspense after chewing one of the deadliest delicacies, but nothing happened. I was very much alive & kicking well. I like it! Plus the fact that my friend said this dish is a lady's favourite as it contains collagen that beautifies the skin. Yum yum! 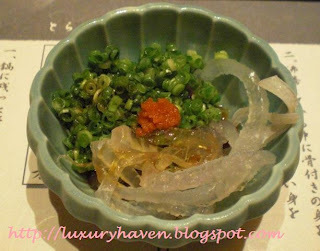 The most popular dish is Fugu Sashimi, also called Fugu Sashi or Tessa. The raw fish are sliced paper-thin & arranged artistically in elaborate rosettes that reveal the pattern of the dish. The plates are sometimes decorated in the form of a chrysanthemum flower which is significant in Japanese culture & symbolic of death. The Fugu Sashimi has a resilient chewiness & is served with the ponzu dipping sauce. 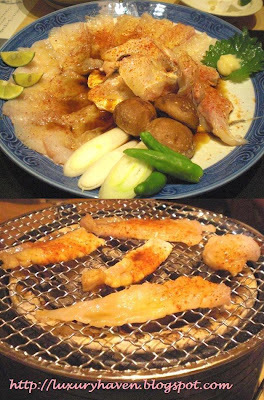 The fins of the fish are also fried & served in hot sake, a dish called Fugu Hire-zake. 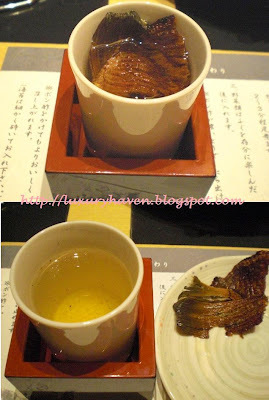 The sake was first flambéed & presented with lid closed to infuse the flavour of the fin. This sake has an unique smell - just like shark’s fin & it tasted real good. The fins are to be taken out of the sake before drinking & kept for a 2nd round. 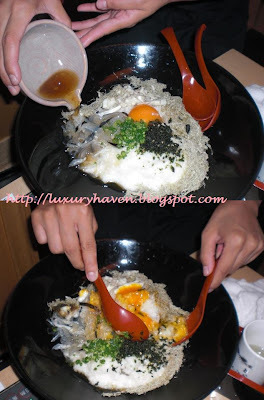 Fugu can also be eaten deep fried as Fugu Kara-age. 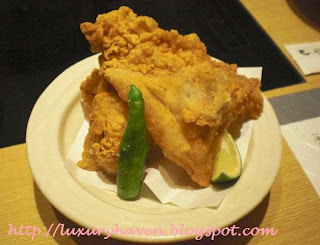 This crispy dish is my favourite, which has a nice meaty texture. It was so tasty…… if only it was boneless. The next course was Yaki Fugu. The fresh Blowfish was presented with special spices, plus vegetables. This charcoal grilled course is an excellent alternative if you’re a BBQ fan. 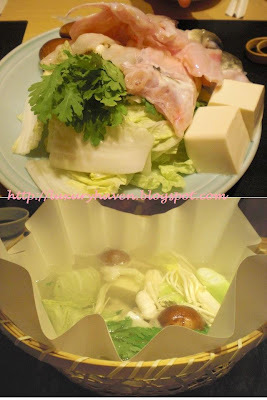 Fugu Nabe or Chiri. Now, here's the thrilling part. The fresh plate of Fugu was still twitching when it arrived at our table (see short clip), which created a feeling of uneasiness amongst us. The dish is a mix of Fugu & vegetables cooked at the table in boiling stock. The tender fish, plus the tasty soup, was simply delicious. When we’ve finished the Nabe, rice & an egg was added to the broth to make Zosui (rice porridge). I’ve always enjoyed Zosui, a perfect antidote especially when I’m ill & this is one of the best I’ve ever tasted. 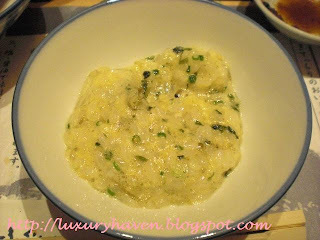 The course also included another type of porridge but I personally much prefer the Zosui. Various ingredients other than Fugu were added to the sticky porridge. This dish was cold & slimy. Frankly, I don’t quite appreciate this dish. The entire exotic Fugu Nabe & Yaki course ended with a sweet dessert. Back in my mind, I was worried to be served Fugu ice-cream, if any. Doubtlessly, the biggest thrill is the striking hubris of the event, the ostentatious risk-taking that involves so much for so little. It was indeed a fatal attraction, a legacy to die for. Special dedication to Ito-san for hosting this bizarre event & Lee for being such a sport. Thanks for letting me know about this post. I have heard about fugu, but I thought I would never eat it. So far I haven't. :) You were very brave! Glad you survived it, because I would miss you a lot if it had done it's lethal job. It is always a mystery to me why people want to cheat death so much. Great post. It was a great, adventurous experience! I heard it's banned in Europe but u do get few restaurants in the US that serve this delicacy. U try?? Very interesting post! I love to see your cooking adventures the most :). Wish I could cook such delicacies as you. Have a wonderful week, my dear. Sad thing is... I can never cook Fugu, Rosidah, only a trained & licensed chef can do that. Thanks for your courage in tasting something so deadly and sharing with everyone here such a great experience. Wow, what a daredevil you are! I would possibly try it, but at the price, it's not something I'll likely try soon. Good for you! WOW, what an amazing post, thanks for taking the time to take pix and notes of your experience. If I got up the nerve to try fugu, I don't think I would have the concentration to additionally take photos and video of the event. I learned alot, amazing experience, thanks for sharing with us! Deli Simplicity, women for beauty, men for thrill?? Interesting, isn't it? Tasty Eats At Home, I'm not always a daredevil. Tooks me yrs to accept d invitation. Family Cuisine Food And Recipe, thks for visiting! 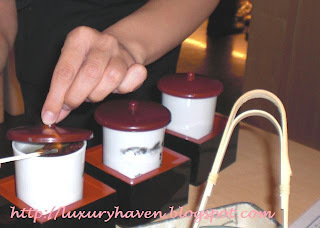 Southern Grace Gourmet, it was a pleasure to recount my experience. My goodness, Shirley, I watched your video clip of the "twitching fish" and was LOL each time it did it! (Glad you explained it was cooked at the table after that.) You're very adventuresome and your write-up of eating this deadly delicacy is as close as I'll get to it. :) Thank you for sharing this popular post! Kim, it was an eye-opening experience for me too! Hahaha! Not sure if I'll do it again. Thanks for sharing this experience, and so glad you're alive! This was such an exhilarating experience, I hope I get to live and tell the tale too IF I get the chance to have this experience as well. Wi, it's cheap thrill! Hahaha! I wouldn't pay to die but since it was a treat, I might as well...... Well, u don't get this type of invitation very often. Hahaha!